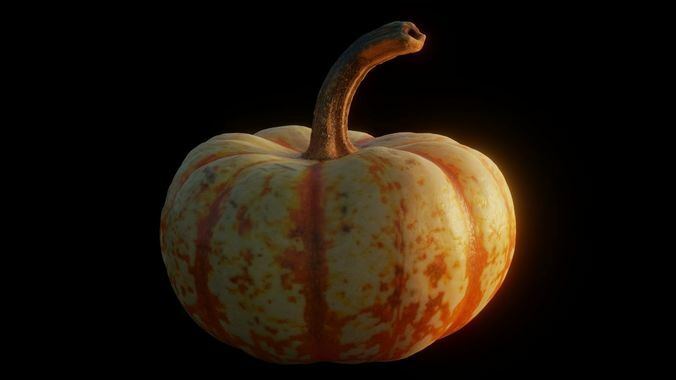 This is a mid-high quality photoscan of a small pumpkin with a base cream color and orange markings. 4K textures for albedo, roughness, and displacement. Cycles material has been set up with the PBR Principled Shader. The raw scan has been retopologized with quads for better mesh integrity. OBJ file format with the necessary UV information for importing into other 3D programs. Only Blender and OBJ files included. While the OBJ file should import into other 3D programs, I cannot guarantee its success (but it's never failed me before for programs like Unity and Unreal Engine). Some texturing around the top of the stem may be slightly off due to the repair work. This model is not intended to be rendered any closer than about 1-2 feet. An HDRI was used to render my featured image, but the HDRI itself is not included.